Surface mounting and through-hole mounting of electronic packages, such as BGAs, QFNs, CSPs, etc. on a substrate can impact the mechanical reliability of finished printed circuit board (PCB) goods. With high-density component packaging and complex layouts, PCBs undergo mechanical and thermal stress from the assembly processes, leading to an increased risk of failures, such as warping, cracking, and failure in the joints between the die and the substrate. When electronic packages are mounted on both sides of a PCB, it is even more imperative to understand the mechanical reliability of a finished PCB. 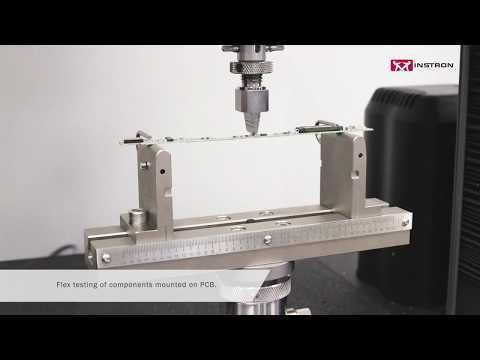 Furthermore, requirements driven by standards, such as the Automotive Electronics Council (AEC-Q200-005A) and IPC TM-650, require testing of finished PCBs to understand terminal failure of surface mounted components after they undergo bending, flexing, and pulling during the assembly process. Mechanical failure of these boards in finished products impact the electrical performance of devices where populated PCBs are used, presenting a risk to OEMs. The Instron® single column and dual column table model systems are designed to conduct bend testing at various force capacities. Additionally, the 2810-400 series of flex fixtures can be outfitted with various anvil radii. Micro 3-point and 4-point bend fixtures are available for miniaturized PCBs. Bluehill® Universal software offers a wide range of calculations to estimate bending stress, flexural strength, and maximum force.